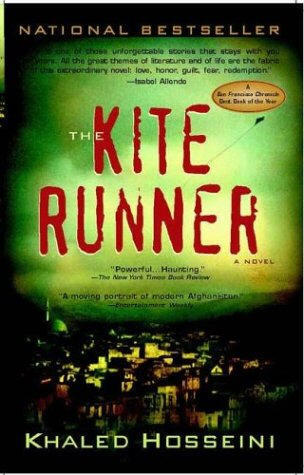 Khaled Hosseini's The Kite Runner is the first Afghan novel to be written in English. Hosseini gives us a story about fathers and sons, about friends and brothers, about the wealthy and the poor and about betrayal, tragedy and redemption. The story, taking place over a period of thirty years, draws us into the turbulent history of Afghanistan as it draws us into the lives of Amir who is Sunni and Hassan who is Shi'a. The title of the book comes from the traditional tournament for Afghan children in which kite-flyers compete by cutting the kite-strings of their opponents with their own razor-sharp, glass-coated strings. To be the one who wins the tournament by downing all the other kites -- and to be the "runner" who chases down the last losing kite as it falls to the earth -- becomes the city champion. Hosseini guides us into the Afghan culture without either losing us or overwhelming us. The part of our world that broke into national American consciousness through terrorism, the Taliban, and war is made human and vulnerable and respected. We walk for a time in Afghan shoes, live in Kabul, hear the children, taste the food, run for our lives, visit Pakistan and come to America...and return on a passionate mission in very dangerous circumstances. A good summer novel if you're looking for one. The Kite Runner is a great novel. If you liked the book, you MUST (I'm usually not so passionate on something like this) buy, or rent, or borrow the unabridged CD version! It is narrated by the author, and the pronunciations and nuances of sound bring the novel alive. I wept throughout the book, then recommended it to my sister (remember Jan Caswell, John?). She wept throughout it, then bought the CD version and wept again. I also got to hear Dayna Curry, one of the two young ladies held hostage by the Taliban (Heather Mercer was the other). They were rescued, almost miraculously by Special Forces, and lived to tell how they secretly met with Afghanistani women for Bible study, and how many hungry women came to know the Lord, even though Dayna and Heather were not officially missionaries (illegal under the Taliban). Anyway, I digress, but Afghanistan is ripe for the gospel, I believe, and The Kite Runner is guaranteed to open your heart to that precious but rough nation. Thanks for opening this book up for us. And thanks Terry, for your input as well. Definitely would like to either read the book or hear it read. yep, great book john. glad you are enjoying some fiction. I'm currently in the middle of a book called "the power of one." It's great too, but not quite as fast a read. It's so good to hear from you again. I'll see if I can find the CD version of *The Kite Runner. * Greet Jan for me. You'll like it. It doesn't take too long to read because you get caught up in the story. I'd heard about "The Kite Runner* from others so I decided to get it. It is a powerful story.